A beautiful picture of a family of Orca as they leisurely swim the waters of Johnstone Strait off Northern Vancouver Island in British Columbia, Canada. The mist from their blowholes hangs in the air as each family member comes to the surface for a breath of air. 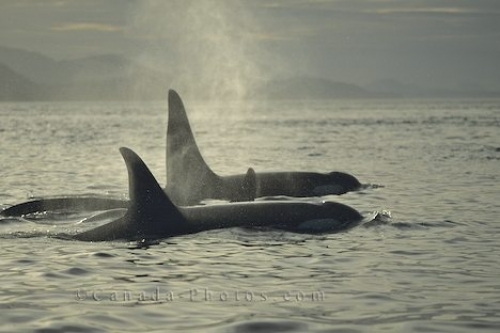 Killer whales in Johnstone Strait, British Columbia, Canada, North America. Photo of a family of Orca in the waters of Johnstone Strait off Northern Vancouver Island in British Columbia.